The most visible program of the Texas Historical Commission seen along the roads of Texas, historical markers commemorate diverse topics — from the history and architecture of houses, commercial and public buildings, religious congregations and events that changed the course of local and state history, to individuals who have made lasting contributions to our state, community organizations and businesses, military sites, and many more. Subject markers are solely educational and reveal aspects of local history that are important to a community or region. A subject marker is placed at a site that has a historical association with the topic, but no restriction is placed on the use of the property or site. No legal designation is required for a subject marker. (1821-1906) Came to Texas from North Carolina in 1845. Fought in Mexican War and Indian campaigns. In the Civil War, commanded Confederate cavalry regiment in Texas outposts from Red River to Fort McKavett. Camps were a day's horseback ride apart. Patrols protected outer settlements and prevented Indian attacks and threatened Federal invasion from Indian territory. Elected to Texas Legislature 1883. Died on ranch near here. Left personal records of his years in frontier defenses. Limestone quarried from nearby hills. Gothic styling. Clock tower modified, 1935, to strengthen roof. Unique iron stairs and railing remain. County's fourth courthouse. First, in 1854, was one-room log cabin. Recorded Texas Historic Landmark, 1965. 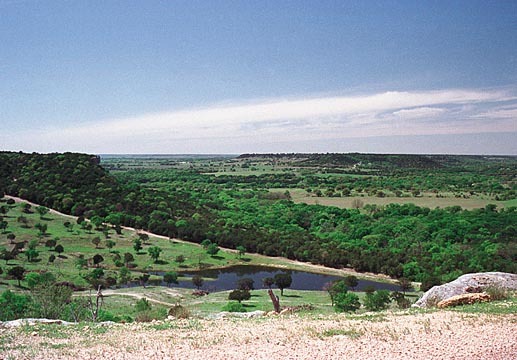 Settlement of northeastern Bosque County began in the 1850s, as people traveling west through the area were attracted to the fertile lands along Cedron Creek. Among the first community projects of the new neighbors was the construction of a school building. 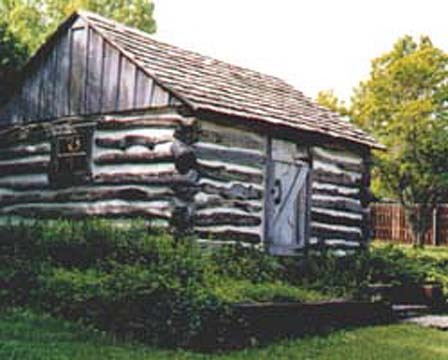 A one-room cedar structure, it was also used for church and social gatherings. 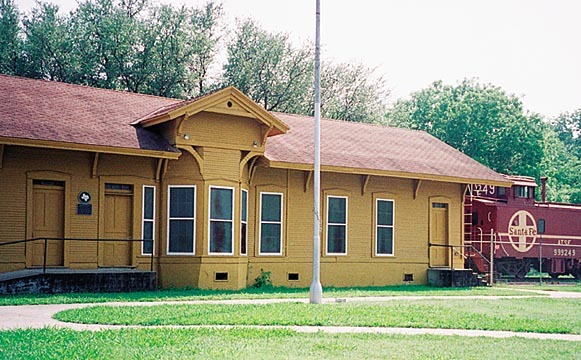 The original schoolhouse was replaced in the 1930s by a newer frame structure. Like its predecessor, it also served as a church and community center. The school was consolidated with other area schools in 1938, and the building later was dismantled. A community cemetery (about one-half miles west) was established on land adjacent to the school building. Although there may have been earlier, undocumented burials, the oldest marked grave is that of school teacher J. T. Hungerford (1844-1880), the apparent victim of tuberculosis. A few days after Hungerford's death, another community resident, Susan J. Arnold (1845-1880) was also buried in the graveyard. Since that time many area citizens have been interred there. Few residents remain in the Cedron vicinity. The cemetery and school building foundation are the last visible reminders of a once-thriving rural community. 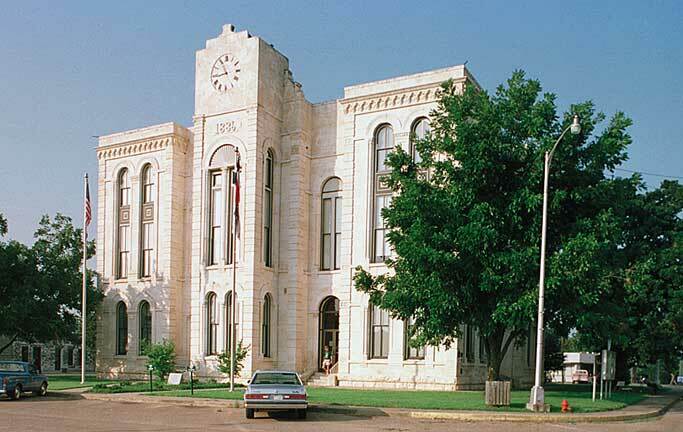 Kimball, one of the first towns in Bosque County, was established at this site in the early 1850s. One of the westward wagon routes forded the river at this crossing until a ferry was built in 1865. The famous Chisholm Trail made its major crossing of the Brazos here. During the 1870s tens of thousands of Texas longhorn cattle forded the river and were driven to northern markets. Building of barbed wire fences and railroads in the 1880s caused abandonment of the Chisholm Trail. Kimball, with no railroad and loss of the cattle trail, became a ghost town by the middle 1900s. Organized May 6, 1896. Located on land donated by N. J. Nelson and T. T. Hogevold. The first building, erected with voluntary donations and labor, opened as high school October 28, 1897; after 1923 housed artifacts collection of Jacob Olson, early Norwegian settler. Under the direction of Dr. Carl Tyssen, president, college courses were offered in 1922; accredited as a two-year college in 1924. High school was discontinued in 1938. College merged with Texas Lutheran College, Seguin, in 1954. Two buildings formerly used by the college remain on the site. 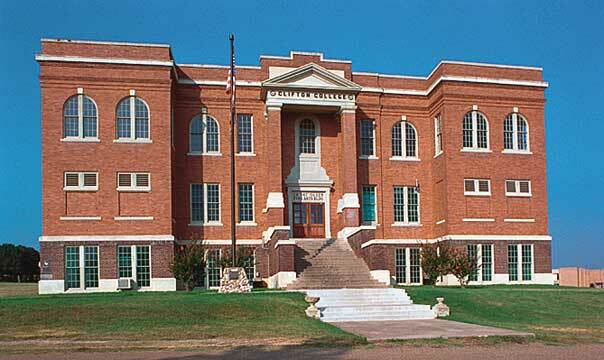 One of three polling places in first election held after Bosque County was organized in 1854. Of 21 votes cast on that occasion (August 7, 1854) in county, 17 were polled under this tree. J. K. Helton was election judge. Officials elected were: L. H. Scrutchfield, judge; P. Bryant, sheriff; Jasper N. Mabray, clerk; Isaac Gary, assessor-collector; Archibald Kell, treasurer. In later years, Bosque County Old Settlers Association used this site for reunions, by the courtesy of Tom M. Pool, owner of the land. Site was known locally as Pool Park. John Clabaugh and W.A. Mason, missionaries for the Texas Baptist Convention, established First Baptist Church of Meridian on March 13, 1859 with ten area residents. Circuit-riding preachers conducted the first worship services, and the congregation met in the county courthouse and in the community school until members constructed a church building in the 1870s. The church moved to new sites in 1888 and again in 1947. Missions hae been a primary focus of the congregation; members have also worked with area youth and with the elderly. Today, First Baptist Church continues to serve as a spirtual leader for the residents of Meridian. This cemetery was originally known as the Morgan Cemetery due to its location on land owned by Daniel Morgan (1818-1892), a native of Kentucky. Morgan came to Texas from Illinois with his family in 1834. Morgan served in the Civil War in Company F, 1st Regimental Infantry, 3rd Brigade, Texas State Troops. In 1842, Morgan married Sara Caroline Childress (1826-1892) and, by 1878, Morgan relocated to Bosque County and purchased land along the eastern fork of the Bosque River. The date of the first burial is unknown as many early graves were marked with common field stones. The first marked burial is that of Martha A. Duke from 1880. Only three known Morgans are buried here: Daniel and Caroline passed in 1892 and their grandson, John Henry Morgan, passed in 1964. Other prevalent names include Jackson, Damron, Rhodes, Ownbey, Philips and Fulton. Oral tradition states that railroad workers and relatives were buried in the Morgan Cemetery due to its close proximity to the rail line. Most of the graves are of simple pioneers who worked as farmers or ranchers along with numerous veterans and persons associated with fraternal organizations. In 1891, the children of Daniel Morgan deeded land to J.W. Fulton and others as trustees. By 1906, the Morgan family had sold all of their Bosque county holdings and moved from the area. The name of the cemetery was changed to Fulton Cemetery sometime after 1892. Covered in native grasses and flowers and surrounded by trees, this historic cemetery contains the remains of many pioneers who settled this rural area. Jens Jenson (1835-1912) came to this county with his Norwegian parents and their family in 1854. Later he was a sailor berthed in Galveston for some years; he also served in the Confederate Army in the Civil War (1861-65). After he bought part of his parents' land in 1867, he built one stone room of this house and married Sarah Swenson in 1868. As his family grew to 11 children, he added rooms, three of stone, two of wood. After his death, a son, Palmer, bought the place. In 1958 grandson Arden Jenson purchased the land. He lives in the house, farming the ancestral acres. Norwegian immigrants moved to Bosque County when it was organized by the Texas legislature in 1854. Most came to Norwegian settlement, which was later named Norse. Two Evangelical Lutheran Churches, our Savior’s Lutheran and St. Olaf’s Kirke, served the people’s spiritual needs. Ole T. Nystel and his family moved to the area in 1866. In 1867, he was captured by Comanche Indians near his home at age 14, and lived with them for three months. After being ransomed and returned, he was confirmed into the Lutheran Church. After A. W. Jensen, a Danish Seventh Day Adventist Evangelist, visited the area in 1880, Nystel was baptized into the Seventh Day Adventist Church. He and other converts organized the Norse S. D. A. Church on Feb. 23, 1880. The first meeting was held Jan. 10, 1881. Members built a small frame church on an acre of land out of the Thomas A. Graves survey, which J. O. Olsen deeded on Sep. 13, 1886, to the church’s general conference at Battle Creek, Michigan. On Apr. 23, 1904, A. E. Anderson deeded one-fifth of an acre to the general conference as a burial ground for church members. Among those interred are ole T. Nystel, his wife, Annie (Anderson), their son, Oscar, who died as a missionary in New Mexico in 1918, and their grandson, Walter Thomas Nystel, a marine killed in World War iiII. The current structure replaced the first sanctuary and was dedicated on Mar. 8, 1913 by Elder Field and Elder Miller. 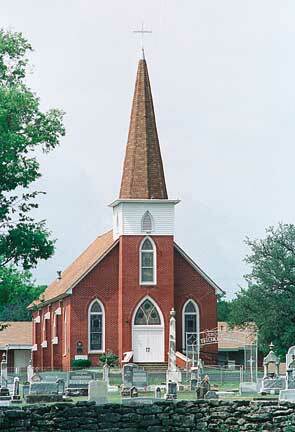 Today it is the oldest standing Seventh Day Adventist Church in Texas. The congregation included a Sabbath School and made yearly offerings to missions as far away as Japan and korea. The last regular services held were Dec. 31, 1927. The congregation has held an annual homecoming since 1983.
from Clifton take FM 219 west about 7 miles; take FM 182 south about 3 miles; house is located on southeast side of the highway as road turns to the west, through gate reading "Norway Mill"
Steiner Baptist Church Steiner Baptist Church began in 1891 in the town of Fowler as Fowler Baptist Church. The church’s first structure was built in 1906 on property donated by Joe Yates, but a fire destroyed the building in 1907 and it was rebuilt the following year. When the name of the town was changed to Steiner in 1916, the church took the name Steiner Baptist Church, and it merged with Cedron Creek Baptist Church of Christ in 1940. 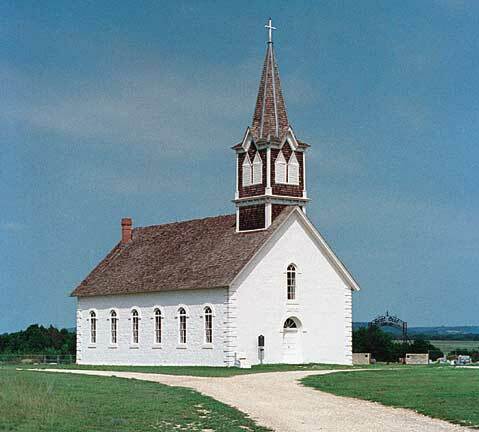 The town of Steiner was compelled to evacuate in 1950 because of the creation of Lake Whitney and the church was moved at that time with mule teams and wagons. However, because it was unable to cross a nearby bridge, it was decided that the church would remain at the roadside, at its present location.